Bourjois Regard Effect Metallise Metalic Eyeliner 51 ( Noir effect miroir) Review ,Swatches.. I am back with another review and this time it is one eyeliner. Actually it is the first eyeliner post at my blog . I love applying eyeliners but till now i am not comfortable with pencil eye liners,I prefer liquid liners more.as these are easy to apply and brings dark lines on eyes. An eyeliner is very important in makeup. You can define your eyes through these and a liner adds extra prettiness to eyes. 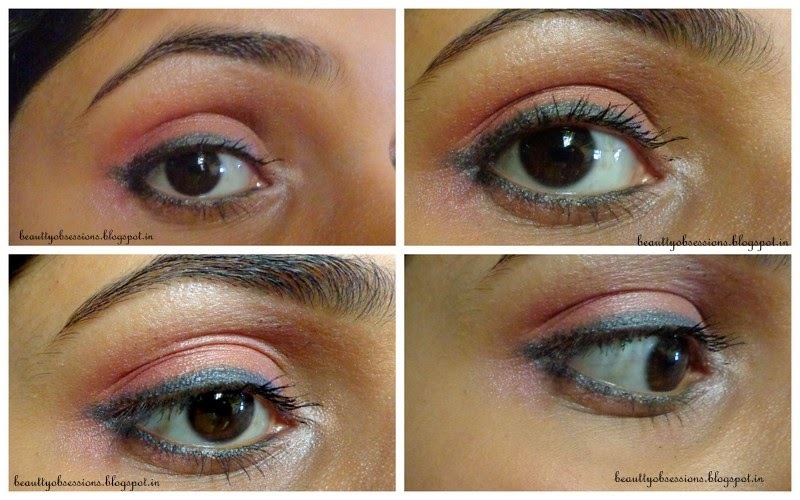 .. Now coloured eye liners are in trend and I also love to add diffent colors to my eyes. Anyway today's post is on Bourjois Regard Effect Metallise Metalic Eyeliner 51 ( Noir effect miroir) which is a quite decent eye pencil and it can be used as a eye liner as well as for smoky eye-makeup. Move down to know more,.. Brand Says: A waterproof metalic eye pencil gives metallic color and sparkling effect with fine texture that easily glides on skin. Packaging: This liner comes in a color coded pencil form. All the liners of this range comes in color coded packaging which helps to identify the shades easily. But due to the pencil form you need to sharpen time to time which leads to waste of product and its a drawback. They also doesn't provide any sharpener with eyeliner. Shade : The Noir effect miroir eyeliner is a metallic black shade . This shade can be used in two ways,one is like an eye liner and second one is like an eyeshadow (for doing smoky eye makeup). This shade will suit all most all skin tones but i think medium to fair skinned girls would rock with it. This range of Bourjois has some very pretty vibrant shades as well and I think these shades are well priced according to its quality and quantity. But bourjois products are not easily available in India..and the online sites has not all the shades available. Water proof and smudge proof.